Violinist Jennifer Sternick is an active and enthusiastic freelance musician. Holding concertmaster positions in eastern and western Pennsylvania, she performs professionally as a soloist and as a member of symphony orchestras, chamber groups, and new music ensembles. As a chamber musician, Jennifer is co-founder and member of Kamratōn, a chamber music collective, and she has recently joined Cuarteto Bravo, Pittsburgh’s premiere tango quartet. ​Jennifer hails from the outskirts of Mohnton, Pennsylvania, where she grew up studying violin with Barbara Lanza. She earned her bachelors in music and philosophy at the University of Pittsburgh, while studying with Roger Zahab. Post-college, she studied intensely with Huei-Sheng Kao of the Pittsburgh Symphony Orchestra. When Jennifer is not making music, she is an avid runner and rock climber. 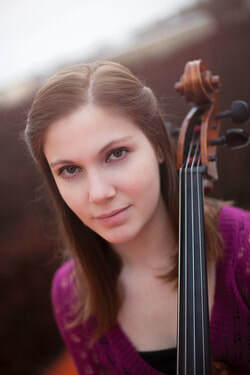 Cecilia Caughman holds a Master of Music degree and an Advanced Music Studies certificate in cello performance from Carnegie Mellon University, where she studied with Anne Martindale Williams. She was a member of the Honors String Quartet and co-principal cellist of the CMU Philharmonic. Currently, Cecilia performs with numerous regional ensembles, including the Johnstown Symphony Orchestra, Erie Philharmonic, and Westmoreland Symphony Orchestra. Certified as a Suzuki cello teacher, Cecilia maintains an active teaching studio in Pittsburgh. A native of Shaker Heights, Ohio, Cecilia earned a Bachelor of Music degree from the Cleveland Institute of Music, studying with Richard Weiss. During her senior year, she served as principal cellist of the Cleveland Women’s Orchestra and as the Librarian of the Cleveland Orchestra Youth Orchestra. Cecilia has spent her summers at the National Repertory Orchestra, Round Top Music Festival and Chautauqua Institution Music Festival, among others. She has played in masterclasses for cellists Desmond Hoebig and Richard Aaron and has been coached by the Pacifica and Cavani String Quartets, as well as Peter Salaff, Noah Bendix-Balgley and Alisa Weilerstein. Bloomington, IN. She performs as the principal clarinetist with the Akron Symphony Orchestra and bass clarinetist with the Evansville Philharmonic, and she has also performed with the Pittsburgh, Richmond, Hartford, Williamsburg, and Johnstown symphonies. Emily is dedicated to performing new music, regularly appearing with Pittsburgh’s Alia Musica and serving as the clarinetist and artistic director of Kamratōn. Emily has also appeared with jazz/world group the Afro-Yaqui Music Collective and is active in Pittsburgh’s free improvisation community. Emily earned degrees in music performance and education at Duquesne University and Lawrence University, where she studied with Ron Samuels and David Bell. She has presented her research on the music of Kaija Saariaho at SUNY Buffalo and the CUNY Graduate Center. Emily teaches woodwind sectionals at Franklin Township Central HS in Indianapolis and formerly served as the choir accompanist at Dutilh United Methodist Church in Cranberry, PA. She is a native of Western Illinois and is a die-hard Cubs fan. She enjoys biking, coffee, and Southern Gothic literature. 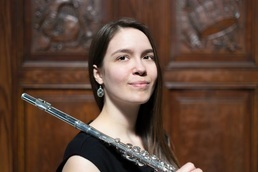 A Boston native, flutist Sarah Steranka enjoys a multifaceted career as a recitalist, chamber musician, and champion of new music. Since making her solo debut with the Carnegie Mellon Philharmonic at the age of nineteen, she has been featured in concert throughout the US and worldwide. Additionally, she has been named a finalist and prizewinner in many national and international competitions, including the International Low Flutes Festival’s Alto Flute Competition and the Flute New Music Consortium’s Flute Artist Competition. ​Sarah is dedicated to exploring the innovative work of living composers and pushing the boundaries of flute performance. The most recent additions to her repertoire include world premieres by Ramin Akhavijou, Marilyn Shrude, Elizabeth Brown, and Zvonimir Nagy. Sarah has appeared on Music on the Edge’s Beyond Microtonal Music Festival and The Pittsburgh Festival of New Music. Additionally, she performs locally with Kamratōn, Alia Musica, Pittsburgh Festival Opera, and the Westmoreland Symphony. ​Ms. Elder intends to push the limits of the human voice and enjoys commissioning new contemporary works that take her there. She experiments and improvises with found objects such as fans, cat toys, aluminum foil, and her own heartbeat. Her repertoire includes works by Giacinto Scelsi, Georges Aperghis, Cathy Berberian, Charles Ives, Anton Webern, Kaija Saariaho, Arnold Schoenberg, Franz Schubert, and Claude Debussy. Anna can be heard on the album Squonk Opera’s “Go Roadshow” and can be seen anywhere from a basement to a concert hall.